Porcelain Veeneers: A hot new arrival this summer! Porcelain Veneers: A hot new arrival this summer! As the humidity rises and summer of 2018 looms large on the horizon, clearly excitement is in the air. And while the weather might be hot, modern dentistry might be even hotter! Due in no small part to the recent advancements made in dental technology, professional dentistry is on fire right now and the heat only seems to keep on rising! With the continuous buzz and chatter surrounding the new changes in the industry, many questions have arisen regarding improvements that have made to well-known procedures that have come to define the dental field as we know it. While this does include improvements to standard, commonly preformed practices such as crowns and fillings, whitening procedures, and even entire tooth replacements, perhaps one of the most frequent inquires is that of dental porcelain Veneers. Although initially introduced during the 1980s, dental porcelain veneers have slowly become one of the most sought after and universally praised methods of cosmetic dental restoration among both practitioners and patients alike! Therefore, to meet consumer’s growing demand, the dental industry has given the wildly popular porcelain veneers something of a 21st century upgrade, thus introducing the all new Lumineers! Dr. Charles R. Kimes at Overland Park Dentistry has seen this treatment option become more and more popular over the years and can now offer his patients the choice of porcelain veneers or Lumineers to achieve the smile of their dreams. Although certainly a cool band with some very catchy songs, the type of Lumineers that we are actually referring to can do some amazing things none the less! Like their predecessors, Lumineers are a clear, shell-like device created with the purpose of being worn directly over your upper and lower rows of teeth. This allows the device to act as a something of a rain jacket, helping protect your teeth from hazardous elements, as well as concealing any prior received abrasions or blemishes that your teeth may have. This ability to create a seemingly flawless smile, is undoubtedly what made porcelain veneers such a sought-after commodity in the past, and what continues to make the new Lumineers the highly coveted item they are today. However, the advantages of dental Lumineers don’t end there. While similar, Lumineers have a number of different aspects and features that provide the user with an easier, safer, and much more pleasant experience! 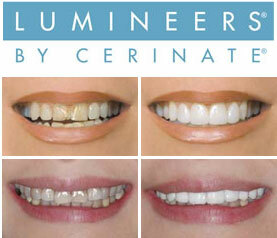 While highly similar to dental porcelain veneers, the newly created Lumineers have a striking number of differences from their predecessors that convey their superiority as a product. Ultimately this proves themselves as a worthy successor to the still highly esteemed porcelain veneers. As corresponding devices with a mutual purpose, Lumineers and porcelain veneers inevitably have much in common in terms of concept and general functionality. Both products are designed to improve the overall appearance of the user’s smile, by shrouding it in a whiter but seemingly natural color tint, while simultaneously concealing any damage or misalignment as achieved through their thin, but durable porcelain material. Despite the obvious similarities, the advantages that Lumineers have over porcelain veneers are unmistakable and can have a significant impact on your teeth. Though efficient, the process of receiving dental veneers can be less then desirable, and if mismanaged or neglected can create problems later on. This is due to the reshaping process, in which some of the surface of your tooth is filed down or removed along with the tooth’s enamel. While this is necessary to prevent excess clutter and maintain the veneer’s natural appearance, should the veneers be removed, the lack of natural enamel will leave the teeth unprotected and vulnerable to outside agents. For many years, the removal of the tooth’s enamel was considered by experts to be the only major downside of veneers; however, with Lumineers this is no longer an issue! Due to the much thinner nature of porcelain Lumineers, (generally around the same consistency as a contact lens) removing your tooth’s enamel or reshaping them is no longer required! By eliminating the invasive reshaping process, Lumineers not only provide a quicker, easier solution, but also succeed in preventing any issues in the long run. Porcelain Veneers: The next big thing! Although porcelain veneers remain a fan favorite within the realm of cosmetic dentistry, the up and coming porcelain Lumineers are sure to quickly surpass them! By effectively avoiding the short-comings of dental veneers, yet continuing to help patients achieve a beautiful, picture-perfect smile, porcelain Lumineers are sure to make a big splash for this summer, and many more to come! Dr. Charles R. Kimes, DDS and his expert team at Overland Park Dentistry look forward to having the opportunity to care for you and your family with any preventative, restorative or cosmetic needs you or your family may have. To schedule your dental appointment or porcelain veneer consultation with your Overland Park Dentist, contact us at our south Overland Park office at (913) 647-8700 or our north Overland Park office at (913) 341-2380.